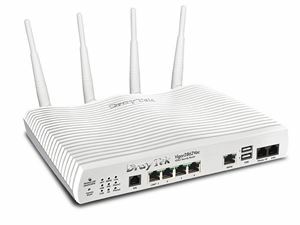 Vigor 2862Vac Series is a ADSL2+ Security Firewall router which is compatible with variants of ADSL. All the models have an RJ-11 DSL port, and a Gigabit Ethernet WAN port which can be used with a cable-modem to connect to a second line for load balancing or failover, there are also two USB ports which can work with 3G/4G/LTE USB modems to add wireless connectivity. Vigor 2862V ac Series features comprehensive firewall and content security management (CSM) to secure the local network. It can also be a central management portal for Vigor APs and Vigor Switches, providing Network Administrator a simpler way to maintain all the network devices.